Roadmaster partners with HABORYN for Eurotour 2012! Roadmaster comes out to annouce the new partnership for the Eurotour of HABORYN which is considered as a revelation in the metal underground and as one of the most representative bands of metal made in Venezuela. HABORYN have presented their new work in 2011 called “At the Edge of Extinction” through the record label Mollusk Records (Spain) and exclusive distribution in Japan by Spitritual Beast Records. They also released the album in CD digital format by AE Distro. 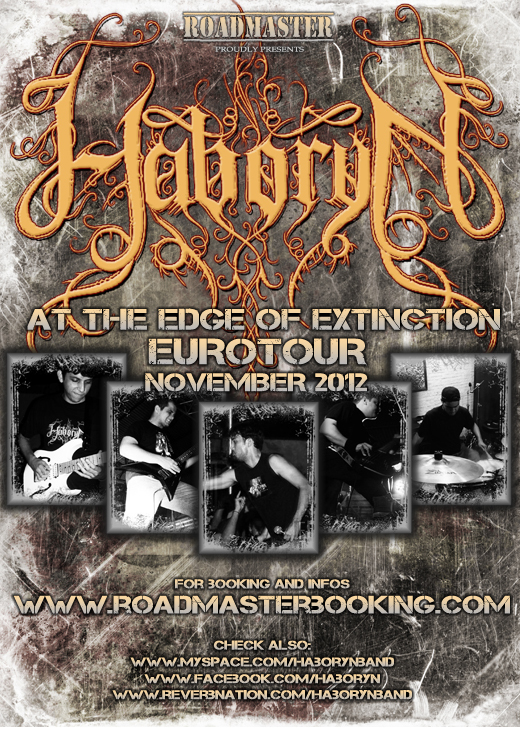 The “At the Edge of Extinction Eurotour” will take place in November 2012. For more information/booking, please contact us by our e-mail contact@roadmasterbooking.com. Roadmaster fecha parceria com Escarnium para Eurotour 2012! Roadmaster fecha parceria com HABORYN para Eurotour 2012!